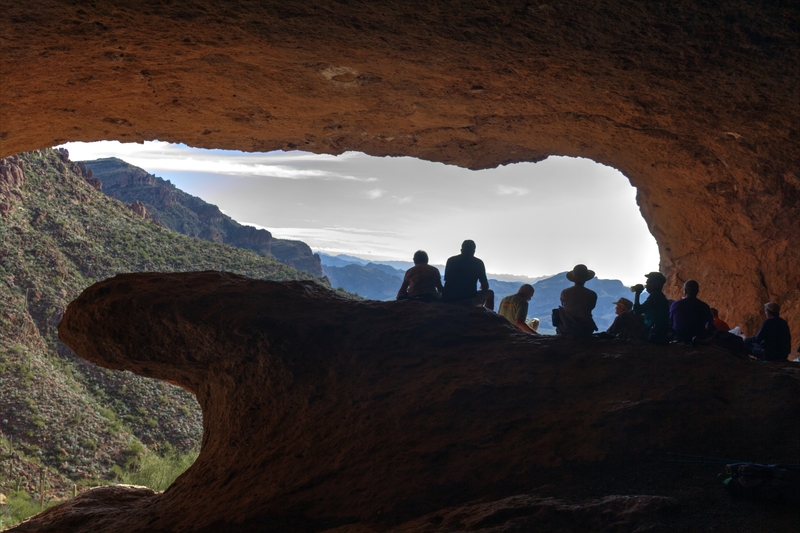 Today Jim Hardy led a group of us on a hike new to almost everyone in the club, a 4-mile (2-in, 2-out) trek to a cave on the flanks of the Three Sisters formation in the Superstitions. You won’t find this hike in any of the “official” places, it is basically a detour off the Carney Springs trail. 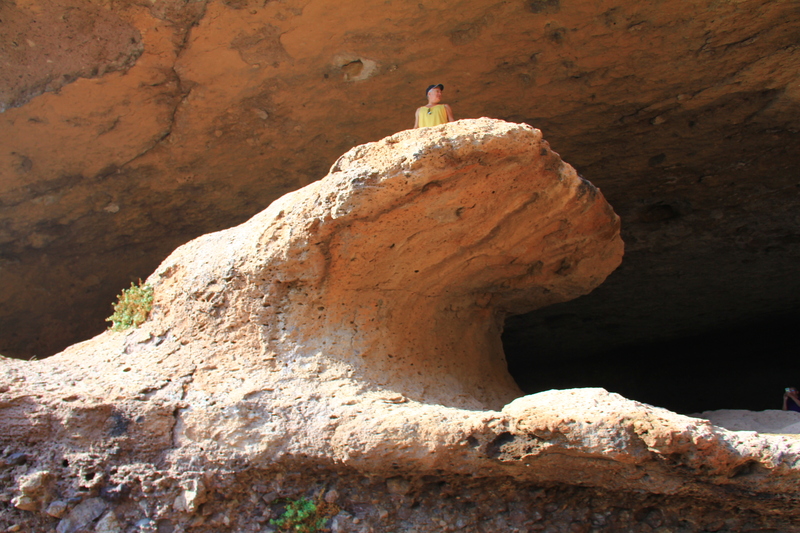 I first heard Dana and Deb Kirke talking about the “Wave Cave” a couple years ago, and being an old Sailor, of course my ears perked up. Back in the day, “Wave Cave” was the nickname of building B30, the barracks where the lady Sailors lived on the Norfolk Naval Station. Turns out this is an actual cave, not at all what first came to my mind. Oh well. 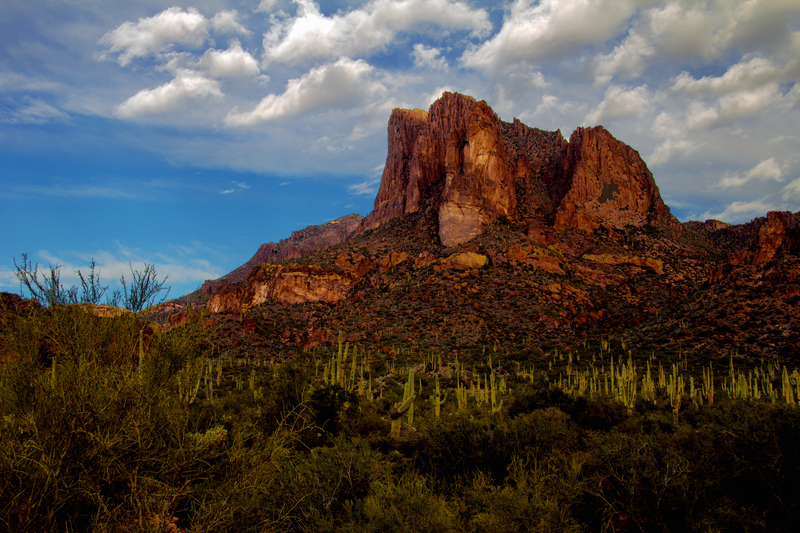 The photo below taken at the trailhead shows the formation known as Three Sisters. Our destination (the cave) is about midway up the right side of the formation. Just below the right peak, about half-way down the photo is a light colored horizontal strip — this looks like an “eyebrow” over the cave. Here is a zoomed in view of that area. 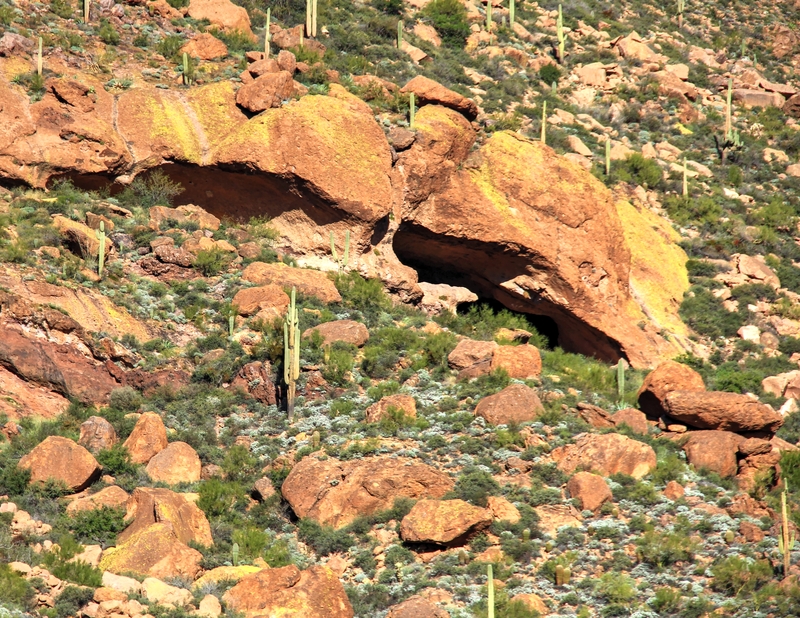 From this vantage the sandstone formation just inside the cave looks like a VERY large white bear. As mentioned earlier, this is not an established hiking route. 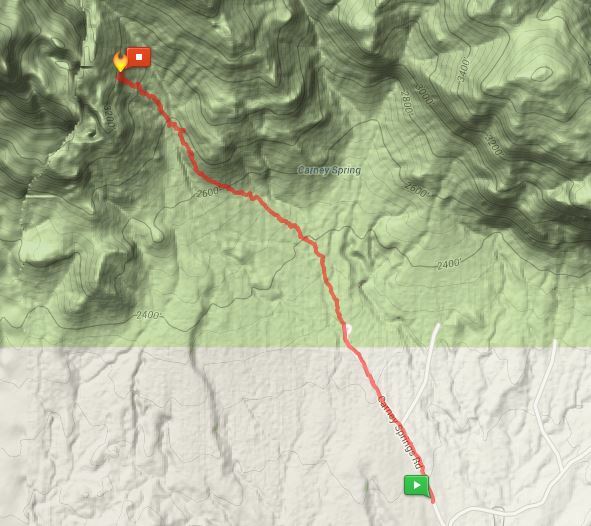 Once you leave the Carney Spring Trail, the route is not always well defined (you’ve all heard of the Lost Dutchman — ask me sometime about the Lost Dutchwoman) and the last third mile is something of a “scramble”. Total elevation gain from the trailhead to the cave is around 900 feet. About 500+ feet of that is in the last half mile. It is not overly difficult, but it calls for good boots, hiking staff(s), and careful attention to your footing and balance, especially when descending on the return trip. Don’t let me scare you off, but this is a “steady as you go” piece of footwork. As you reach the cave, the “bear” seen from afar now resembles an ocean wave, thus the name “Wave Cave” the Dana and Deb attached to this place. The interior of the cave is quite large, I’d estimate 2 or 3 times the size of the Canyon Vista ballroom. 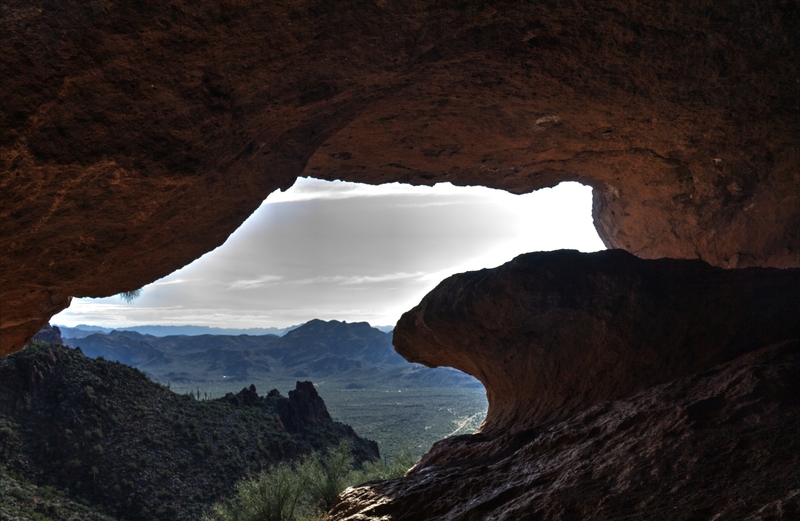 It would seem that it would have been a good dwelling place for the Indians who build many structures in caves all around the Superstitions, but I didn’t seen any evidence of that sort of occupation. From a vantage inside the cave, the “wave” is even more convincing. Some of us couldn’t help striking a “surfer” pose! The wave also served as a good spot to eat our lunch and enjoy the long-horizon views below. 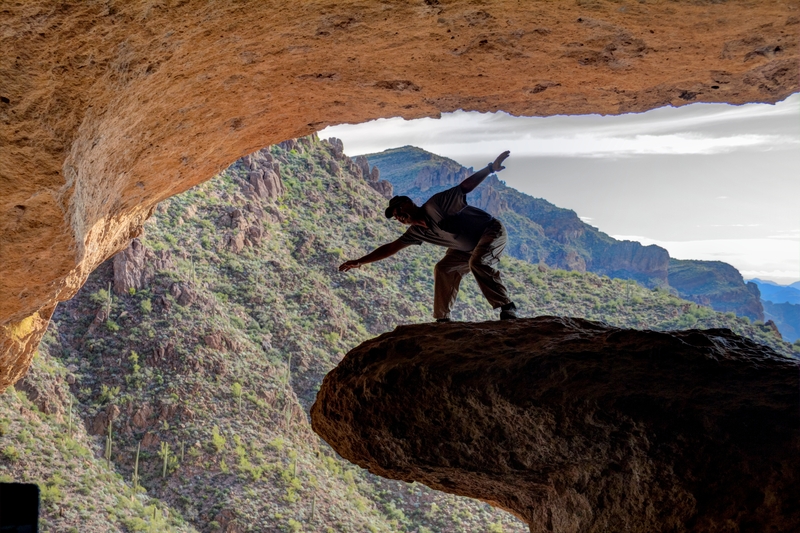 Put this one on your bucket list, but pick a cool day. That last leg of the climb will drain your water reserves quickly on a warm day. Check out their description Hans. Nice pics as always! Maybe if you are in you 20’s. I think we’ll take our son up there when he comes next month. He could probably do it 3 times while we trudge up and down. One of our sons is also coming in early Feb. I’m thinking Peralta Canyon to the lone pine tree. Beautiful pictures Hans. Thank you for sharing. Does this one get a lot of traffic? I’m hoping to camp in a cave overnight (leave no trace, of course) but don’t want to deal with loads of hikers tramping in and out. No, this gets very little traffic. Few people know there’s a way to reach it.